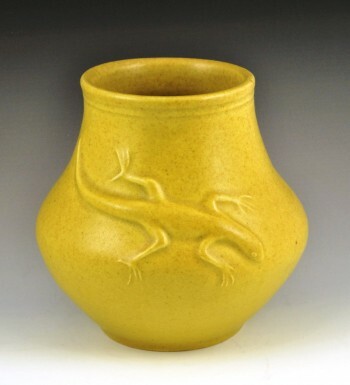 The frog bowl was inspired by the pottery of W. H. Trippett, founder of Redlands Pottery (circa 1904). Trippett was a former art metal worker for Tiffany Studios. He self-trained in ceramics for three years before opening his business out of his home on Summit Avenue in Redlands, California. A trio of frogs surround this bowl. Some frogs are partially covered by leaves. 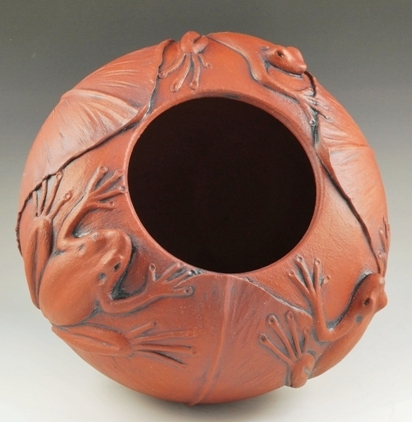 I threw the bowl on a potter’s wheel and sculpted the frogs and leaves on the surface when the clay was leather hard. The clay is terracotta-colored stoneware. To enhance the design, I applied an oxide wash before the bowl was fired. After firing, I rubbed the bowl with beeswax. To learn more about W. H. Trippett and see examples of his work, you can go to http://www.isaklindenauer.com/exhibits-and-essays.html.